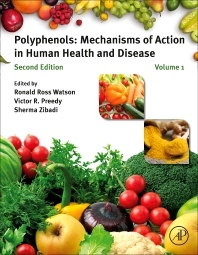 Polyphenols: Mechanisms of Action in Human Health and Disease, Second Edition describes the mechanisms of polyphenol antioxidant activities and their use in disease prevention. Chapters highlight the anti-inflammatory activity of polyphenols on key dendritic cells, how they modulate and suppress inflammation, and how they are inactivated or activated by metabolism in the gut and circulating blood. Polyphenols have proven effective for key health benefits, including bone health, organ health, cardiac and vascular conditions, absorption and metabolism, and cancer and diseases of the immune system. They are a unique group of phytochemicals that are present in all fruits, vegetables and other plant products. This very diverse and multi-functional group of active plant compounds contain powerful antioxidant properties and exhibit remarkable chemical, biological and physiological properties, including cancer prevention and cardio-protective activities. Ronald Ross Watson, PhD, is Professor of Health Promotion Sciences at the University of Arizona, Mel and Enid Zuckerman College of Public Health. Dr. Watson began his research in public health at the Harvard School of Public Health as a Fellow in 1971 doing field work on vaccines in Saudi Arabia. He has done clinical studies in Colombia, Iran, Egypt, Saudi Arabia and the United States which provides a broad international view of public health. He has served in the military reserve hospital for 17 years with extensive training in medical responses to disasters as the chief biochemistry officer of a general hospital, retiring as a Lt. Colonel. He is a distinguished member of several national and international nutrition, immunology, and cancer societies. Dr. Watson’s career has involved studying many lifestyle aspects for their uses in health promotion. He has edited over 100 biomedical reference books and 450 papers and chapters. His teaching and research focuses on alcohol, tobacco, and drugs of abuse in heart function and disease in mouse models. Victor R. Preedy, PhD, is Professor of Nutritional Biochemistry in the Department of Nutrition and Dietetics, at the King's College in London. He is also a Professor of Clinical Biochemistry in the Department of Clinical Biochemistry. Dr. Preedy is also Director of the Genomics Centre, King's College London. He was elected a Fellow of the Royal College of Pathologists in 2000. In 1993, he gained a D.Sc. degree for his outstanding contribution to protein metabolism. He was elected as a Fellow to the Royal Society for the Promotion of Health (2004) and The Royal Institute of Public Health (2004). In 2009, Dr. Preedy was also elected as a Fellow of the Royal Society for Public Health (RSPH). He has written or edited over 550 articles, which includes over 160 peer-reviewed manuscripts based on original research and 85 reviews and 30 books. His interests pertain to matters concerning Public Health and how this is influenced by nutrition, addictions and other lifestyle factors. Professor Preedy is especially committed to bridging the person-public health divide. Dr. Sherma Zibadi received her Ph.D. in Nutritional Sciences from the University of Arizona. Her medical degree and training were done at the Mashhad University of Medical Sciences. She then completed her post-doctoral research fellowship awarded by the American Heart Association where her research involved cardiology and complementary medicine studies. Her research has involved maladaptive cardiac remodeling process, which helps to identify new targets for treatment of heart failure. Dr. Zibadi’s research interest also extends into foods as medicines, exploring the preventive and therapeutic effects of dietary supplements on heart failure and its major risk factors in both basic animal and clinical studies, translating lab research findings into clinical practice. Dr. Zibadi is an author of more than 35 research papers in peer reviewed journals. She has been an editor on 8 scientific books like this one being proposed. She has edited on a variety of clinical topics: breast milk, bottle feeding, wheat and rice in health, polyphenols and health, omega 3 fatty acids, dietary supplements in immune modulation, and dietary fat and health. She and Dr. Watson have collaborated extensively on both laboratory research and editing.